An Old World native, now a well established weed of disturbed places, roadsides, and fields, also invading shores, and other open habitats. First collected in 1886 in Kent Co. The garden carrot, with enlarged, orange, brittle roots, is derived from this complex and variable species, and may be called D. carota var. sativus Hoffman or subsp. sativus (Hoffm.) Arcang. 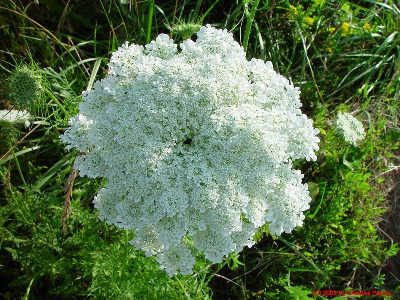 Wild carrots have whitish, often branched, relatively slender and tough roots; they may smell like carrots, and are not poisonous, but they are unpalatable. There is usually a dark purple flower in the center of each inflorescence, and very rarely all the corollas are pink or purple. Green flowered variants have also been observed. See also notes under Carum carvi. MICHIGAN FLORA ONLINE. A. A. Reznicek, E. G. Voss, & B. S. Walters. February 2011. University of Michigan. Web. 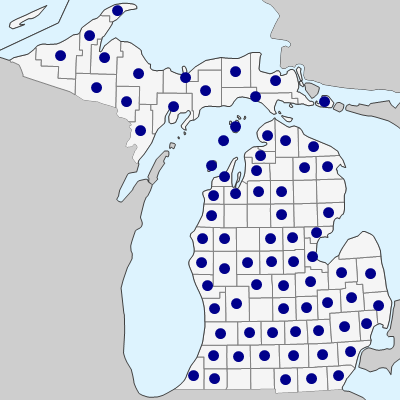 April 26, 2019. https://michiganflora.net/species.aspx?id=119.